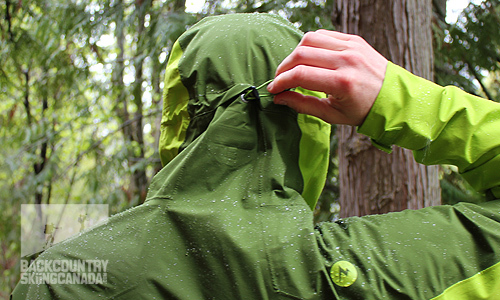 With all the features you'd ever want in a rain shell but built tough enough to use all year long the Marmot Artemis Jacket does it all. Narrowly edging out the Marmot Essence jacket for our coveted Gear of the Year Award the Artemis jacket offers up incredible breathability and stretch that you really appreciate on those long gruelling climbs and skin tracks. It's also a looker to boot! Marmot has been on a bit of a tear lately with several very positive back to back reviews here at Backcountry Skiing Canada. Two recent winners are the Marmot Nabu Jacket which uses Polartec Neoshell fabric and the Marmot Isotherm Hoody which uses Polartec Alpha insulation. 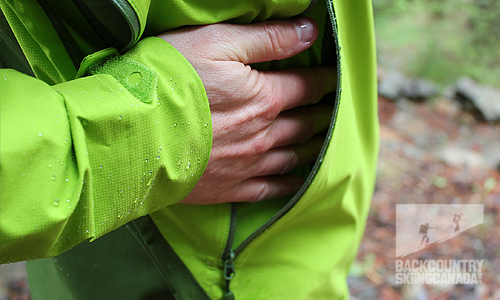 While the Marmot Artemis Jacket we’re reviewing here today does not use a Polartec fabric I had to take a second look to ensure this was actually the case. I say this because the Artemis is so soft and stretchy it feels very similar to the Neoshell used on the Nabu Jacket. In fact I consider the Marmot Artemis to be a lighter version of the Marmot Nabu Jacket thanks to its softshell feel and hardshell performance. Instead of Neoshell, the Artemis uses a 2.5 layer lamination technology Marmot calls NanoPro Membrain™. 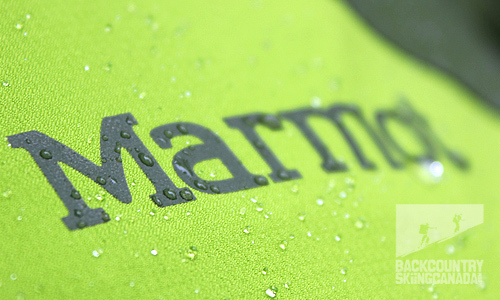 This allows the Marmot Artemis jacket to be lighter, more compact and easier on the wallet than other similar jackets. 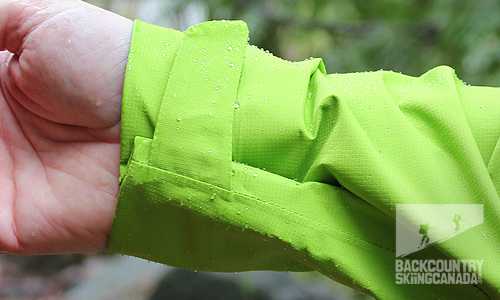 The fact that the Artemis Jacket boasts a 10k/20k waterproof/breathable rating is reason to cheer but there is far more that makes this a great jacket. The Artemis comes equipped with a heap of features typically found on ePTFE (expanded polytetrafluoroethylene) jackets that carry much higher price tags due to their Gore-Tex and eVent labels. Top of the feature list has to be pit zip as these are not traditionally found on jackets in this price range. Combined these with mesh lined pockets and you have a heap of additional venting when needed. The internal zippered pocket (with media port) and three way adjustable hood with mouldable wire brim round out the feature set to make the Artemis Jacket a truly full featured offering. 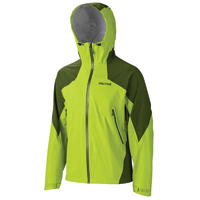 The Marmot Artemis Jacket is made out of NanoPro™ MemBrain® which is made of 100% Nylon Shadow Ripstop Stretch fabric. 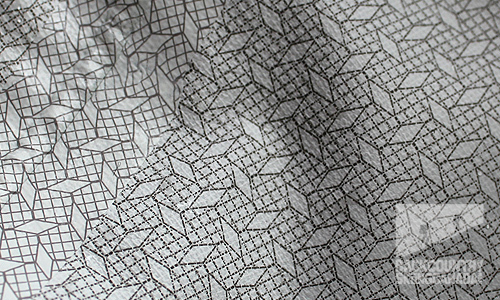 I have to say that this fabric is pretty high-tech stuff. In fact, Marmot declares it to be their “most comfortable waterproof/breathable technology ever”. A lofty claim that is possible due to the fabric’s microporous structure and the reduced amount of adhesive required to bond the membrane to the fabric. These factors together mean that the fabric is air permeable and thus allows moisture vapour to escape without compromising the waterproofing or windproofing of the jacket. 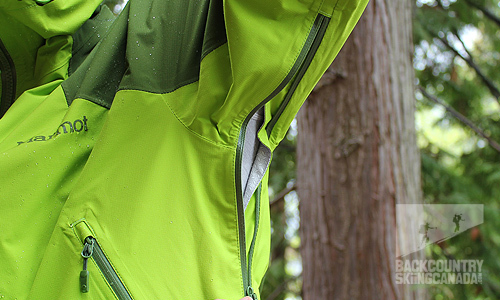 According to Marmot, the fabric actually allows up to 140% more airflow than other fabrics. In addition, at only three microns, the pore structure is 200 times smaller than previous generations of Marmot fabrics and, therefore, is designed to keep more water out. On top of all this high tec wizardry, the Artemis is also super lightweight as the Nylon Shadow Ripstop Stretch fabric weighs a scant 2.9 oz/ yd. It also has incredible stretch which provides a good range of motion for aerobic activities and is incredibly comfortable without the rubbery or clammy feeling present with other rain shell jackets. Most laminated rain shells in my experience make me feel wet and clammy, even when it isn’t raining. This is especially true on warmer summer days when a rain shower rolls in and all I have on under my shell is a T-shirt which allows my skin to touch the rubbery interior of the shell fabric. Not so with the Marmot Artemis Jacket. While this is still a laminate jacket and not a Gore-Tex, eVent or Neoshell fabric it did a fine job of breathing and also keeping moisture out. 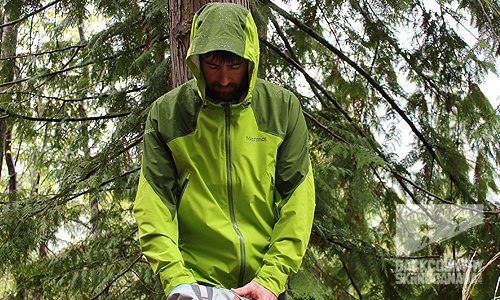 As you saw from the technical numbers in the fabric section above, the Artemis jacket works to keep you both dry and comfortable. Any fabric, however, can be overpowered by interior moisture build up if the weather is too warm, the subject dressed too hot or the activity too intense. While the Marmot Artemis Jacket is no exception to these three tenants I did find that it worked almost as well as its more expensive ePTFE (expanded polytetrafluoroethylene) counterparts and far better than other laminate jackets on the market. 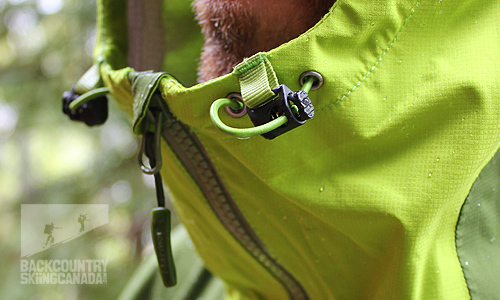 I tested the Artemis fully zipped on several leisurely flat day hikes with 20°C temps and found that I did not sweat. Wearing only a short sleeve wick top I didn’t find the jacket’s interior laminate sticky or clammy as I was expecting. On one particular cold rainy day I was climbing more moderately and found that I had over estimated the need for insulation so I did overheat. As a result, I opened up the pit zips and two mesh hand pockets and in no time I had brought my core temp back to a manageable degree and was able to continue without overheating or perspiring. While I am sold on the NanoPro™ MemBrain® technology and how it performed I did notice a few potential changes that would improve the jacket’s other features. First on my changes wish list is to have larger pit zips with dual zips. This would provide more venting and the ability to vent from the top or bottom based on preference and weather conditions. Second, are improvements to the jacket’s collar. The side hood adjustments are located directly in front of your mouth which means that when the collar is zipped up they get in the way. In addition, there is no internal fleece fabric on the inside of the collar so your chin is not treated as nicely as it could be. These are only small gripes and if altered they would make an awesome jacket even better. 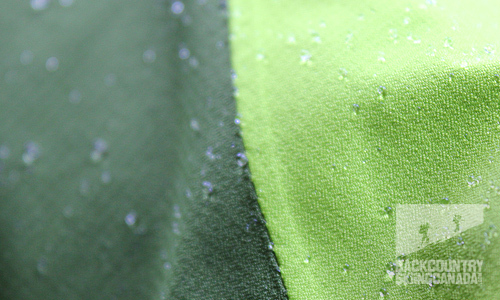 If you are looking for an even lighter and more minimalistic rain shell then check out the Marmot Essence Jacket review here. - Exterior fabric is soft and super stretchy providing a huge range of motion. 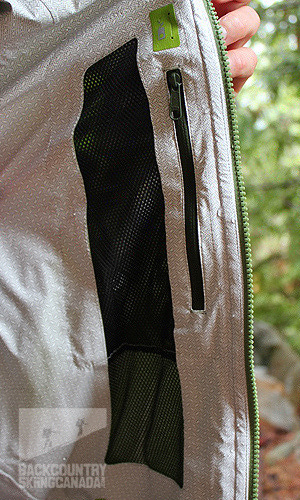 - Pit zips are always a nice feature to have and along with the mesh hand pocket liners, venting hot air is easy. - Pockets are huge and pack friendly. This is both a pro and a con as you can loose items in the pockets as they are so large and deep. - The two tone fabric is a nice design change from the traditional monotone approach. 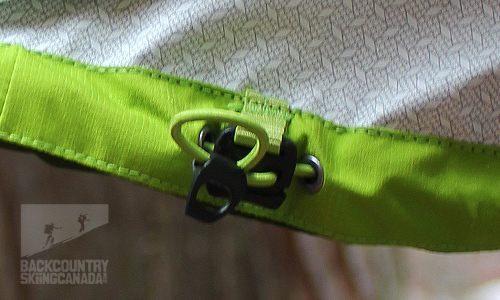 - Pit zips could be a touch longer and possibly have double zips to enable top or bottom venting. - Laminate rain wear is less durable than a ePTFE (expanded polytetrafluoroethylene) jacket so additional care is required.